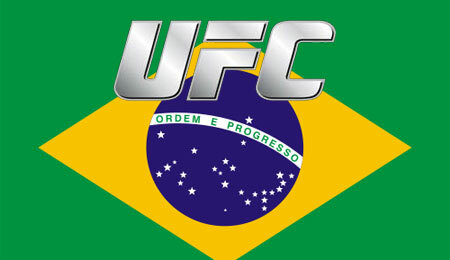 Watch today’s UFC 142 weigh-ins LIVE from the HSBC Arena in Rio de Janeiro, Brazil, starting at 4 p.m. ET (1 p.m. PT) — 7 p.m. BRST on ProMMAnow.com. Check out photos from Thursday’s “UFC 142: Aldo vs. Mendes” pre-fight press conference which took place at the Copacabana Palace in Rio de Janeiro, Brazil. Thursday’s UFC 142: Aldo vs. Mendes pre-fight press conference will stream LIVE on ProMMAnow.com from Copacabana Palace in Rio de Janeiro, Brazil, starting at 10 a.m. ET (7 a.m. PT). Athletes competing on this weekend’s UFC RIO™: ALDO vs. MENDES card landed today in Brazil and the city is already buzzing about the action-packed event. Headlined by a UFC featherweight title fight between champion Jose Aldo of Rio and top contender Chad Mendes, the event also features an outstanding middleweight co-main event pitting former UFC champion Vitor Belfort against rising middleweight prospect Anthony “Rumble” Johnson. Carlo Prater talks about his upcoming fight at UFC 142, what it’s like making his debut with the organization in his home country and what he has done to prepare for the dangerous Erick Silva. UFC featherweight champion Jose Aldo, along with his UFC 142 main event opponent Chad Mendes, as well as co-headliners Vitor Belfort and Anthony Johnson took questions from the media on Wednesday’s conference call. Today’s UFC 134: Silva vs. Okami press conference streams LIVE from Rio de Janeiro starting at 1 p.m. ET/10 p.m. PT right here on ProMMAnow.com. Anderson Silva vs. Yushin Okami headlines. Do you understand there are 14 Brazilian UFC fighters fighting on a card in Brazil this weekend? The G.O.A.T. was on Copacabana Beach in Rio de Janeiro today for an open workout in front of fans. 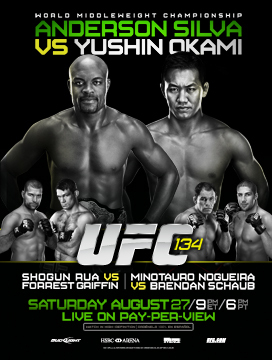 On Aug. 27 “UFC 134: Silva vs. Okami” will take place at HSBC Arena in Rio de Janeiro and feature UFC middleweight champion Anderson Silva vs. Yushin Okami in the main event. Watch this UFC Rio preview. Tickets for UFC Rio (UFC134) went on pre-sale Thursday. In just one hour and 14 minutes all 16,752 tickets were sold out. Curitiba’s Anderson Silva will face Yushin Okami in the main event.